Six bronze horses created by the British sculptor Hamish Mackie were unveiled last night (25 June, 2015) galloping through an extraordinary new public square at Goodman’s Fields in Aldgate. Each of the six giant bronze sculptures weighs a tonne and over a kilometre of armature steel was required to build them. They will now sit at the heart of a 7 acre mixed use development, providing 1,038 new homes and 600 permanent jobs, as well as a one acre public park. The sculptures were commissioned by Berkeley Homes to bring alive the history of the site, where once Mr. Goodman leased out the fields for London’s livery horses. They will now hurtle in an arc through the piazza towards Leman Street where the lead stallion rears up dramatically – eyeballing commuters on every passing double-decker bus. Hamish Mackie began his career as a sculptor in a converted carthorse stable and became known for his ability to capture the essence, movement and energy of wild animals in their natural habitat. He models directly into clay after an intense period of observation, expressing the individual character of each animal he sculpts. 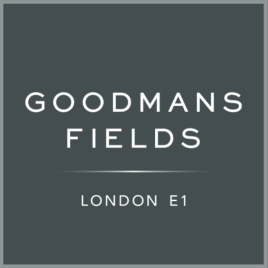 To set the horses in Goodman’s Fields, Berkeley commissioned some of the leading technical and landscaping engineers in the UK. John Murdoch of Murdoch Wickham Landscape Architects, has designed a landscape that matches the horses in beauty and ambition: mature trees, pools and fountains follow the curved path of their charge through the piazza. The sculptures also echo London’s rich equine history and highlight the profound relationship that a city built on horse-power has with this magnificent animal.